We get a lot of patients who come to our office asking for Lumineers. Lumineers are marketed aggressively, so they enjoy widespread name recognition. A lot of people, however, don’t realize that Lumineers are simply one brand of porcelain veneers, and there are a number of brands available. Lumineers have one significant drawback, and that is the company that manufactures that brand has placed a trademark restriction on them requiring dentists who place them to use the Lumineers laboratory in California. While this is a good financial arrangement for the company, that laboratory has been criticized by cosmetic dentists as producing work that looks bulky and opaque. 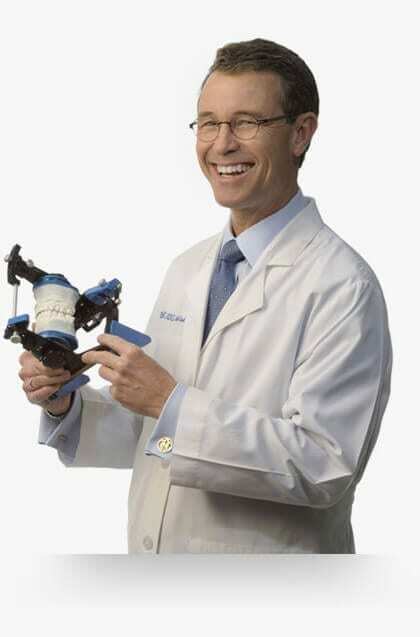 Dr. Arnold has a strong working relationship with his master ceramist, Michael Morris, and together they have produced smiles that have won multiple medals in the AACD International Smile Gallery competition. He prefers using brands of porcelain where he has the latitude to work with his own technician. Mr. Morris is one of only four dental ceramists in the world who have achieved the Accredited Fellow credential from the American Academy of Cosmetic Dentistry. One of the claims made in Lumineers marketing is that their brand is strong enough to be made ultra-thin, meaning that sometimes the veneers can be placed without having to grind any on the teeth beforehand. While this claim is true, there are a couple of other things you should know about it. First, there are other brands that have this extra strength and can be made ultra-thin. Second, one of the criticisms of the Lumineers laboratory is that they tend to make the teeth bulky-looking and too large. Some dentists who place Lumineers tend to compensate for this by grinding the teeth down somewhat anyway. 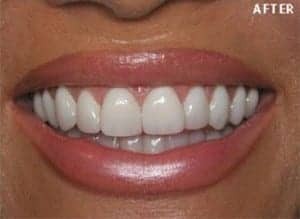 Dr. Arnold has done a number of cases of no-preparation porcelain veneers, but he insists that every smile he creates needs to look beautiful. in his approach might be with photographs. On the right is a case done by another dentist using Lumineers. Notice how the teeth look somewhat bulky and there is no feeling of depth in the teeth—the color appears flat. By comparison, the lower photograph is of a case done by Dr. Arnold using another brand of ultra-thin veneers. This case was also done with no tooth preparation and was created working with his master ceramist. This is actually a close-up of Alexandra’s smile, the patient pictured in the header of this website. Notice that they have left the teeth with a natural contour, not bulky. Notice also the feeling of depth given by the color and translucency and also the sparkle in the smile. You don’t get this with Lumineers. 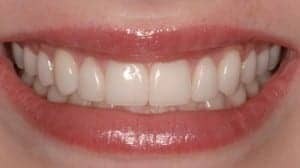 If you want more information and what a smile makeover can do for you, you may click here to read our porcelain veneers page. If you’re ready to get started on your new smile, you may call our office to schedule and appointment or you may click here to request an appointment online.